TCF/LEF factors are ancient context-dependent enhancer-binding proteins that are activated by β-catenin following Wnt signaling. They control embryonic development and adult stem cell compartments, and their dysregulation often causes cancer. β-catenin-dependent transcription relies on the NPF motif of Pygo proteins. Here, we use a proteomics approach to discover the Chip/LDB-SSDP (ChiLS) complex as the ligand specifically binding to NPF. ChiLS also recognizes NPF motifs in other nuclear factors including Runt/RUNX2 and Drosophila ARID1, and binds to Groucho/TLE. 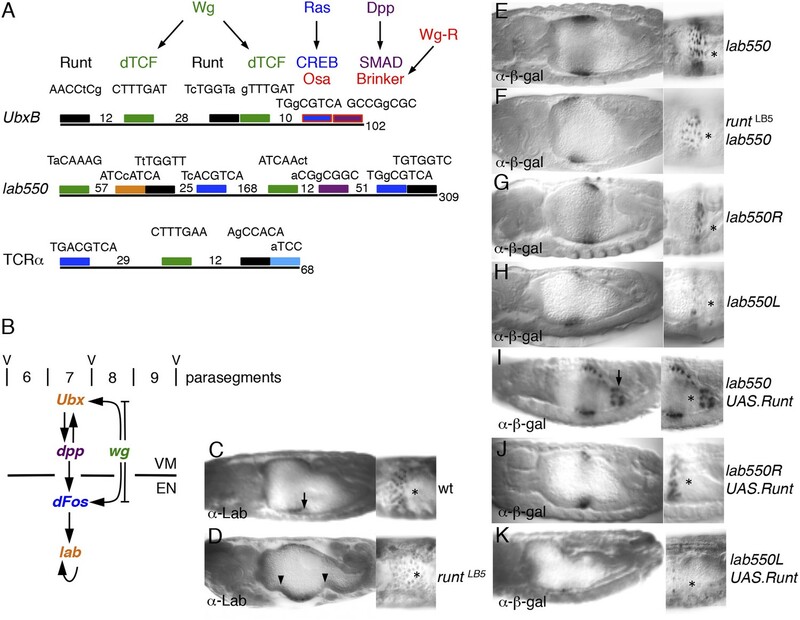 Studies of Wnt-responsive dTCF enhancers in the Drosophila embryonic midgut indicate how these factors interact to form the Wnt enhanceosome, primed for Wnt responses by Pygo. Together with previous evidence, our study indicates that ChiLS confers context-dependence on TCF/LEF by integrating multiple inputs from lineage and signal-responsive factors, including enhanceosome switch-off by Notch. Its pivotal function in embryos and stem cells explain why its integrity is crucial in the avoidance of cancer. In animals, cells have to be able to communicate with neighboring cells in order to generate and maintain the different tissues and organs. One ancient method of cell communication that is used in all animals is the Wnt signaling pathway. In this pathway, a cell secretes a protein called Wnt, which binds to a Wnt receptor present on the surface of another cell. This triggers a cascade of signals inside the second cell that leads to the activation of proteins called TCF factors. These proteins bind to regions of DNA called enhancers to trigger the expression of particular genes that control the development of the animal. Hyperactive Wnt signaling in humans can result in cancer, so Wnt signaling is tightly controlled to avoid this. One of the proteins that regulates Wnt signaling is called Groucho and it interacts with TCF to prevent it from activating genes in the absence of a Wnt signal. However, when Wnt is present, a protein called Pygo overcomes this repression by Groucho to activate TCF, but it is not clear how this works. Fiedler, Graeb, Mieszczanek et al. discovered that Pygo directly binds to a protein complex called Chip/LDB-SSDP (or ChiLS for short). ChiLS is able to associate with TCF enhancers through its association with Groucho. Fiedler, Graeb, Mieszczanek et al. observed that ChiLS can also interact with a number of other proteins that control body formation. This enables ChiLS to integrate multiple signals that regulate the activity of TCF factors. Fiedler, Graeb, Mieszczanek et al. named this complex the ‘Wnt enhanceosome’ because it serves to activate the expression of genes in response to Wnt signaling. Fiedler, Graeb, Mieszczanek et al. analyzed the role of the Wnt enhanceosome during the development of the fly wing and the embryo's midgut. Many genes that are required to form these organs were switched on by the Wnt enhanceosome. This study shows that ChiLS and Pygo are core components of a large complex of proteins that regulate animal development. The next challenge is to study how the components of this complex work together to regulate the enhancers in response to different signals. TCF/LEF factors (TCFs) were discovered as context-dependent architectural factors without intrinsic transactivation potential that bind to the T cell receptor α (TCRα) enhancer via their high mobility group (HMG) domain (Waterman and Jones, 1990; Giese et al., 1992). They facilitate complex assemblies with other nearby enhancer-binding proteins, including the signal-responsive CRE-binding factor (CREB) and the lineage-specific RUNX1 (also called Acute Myeloid Leukemia 1, AML1). Their activity further depends on β-catenin, a transcriptional co-factor activated by Wnt signaling, an ancient signaling pathway that controls animal development and stem cell compartments, and whose dysregulation often causes cancer (Clevers, 2006). The context-dependence of TCFs is also apparent in other systems, for example in the embryonic midgut of Drosophila where dTCF integrates multiple signaling inputs with lineage-specific cues during endoderm induction (Riese et al., 1997). The molecular basis for this context-dependence remains unexplained. In the absence of signaling, T cell factors (TCFs) are bound by the Groucho/Transducin-like Enhancer-of-split (Groucho/TLE) proteins, a family of co-repressors that silence TCF enhancers by recruiting histone deacetylases (HDACs) (Turki-Judeh and Courey, 2012) and by ‘blanketing’ them with inactive chromatin (Sekiya and Zaret, 2007). TLEs are displaced from TCFs by β-catenin following Wnt signaling, however this is not achieved by competitive binding (Chodaparambil et al., 2014) but depends on other factors. One of these is Pygopus (Pygo), a conserved nuclear Wnt signaling factor that recruits Armadillo (Drosophila β-catenin) via the Legless/BCL9 adaptor to promote TCF-dependent transcription (Kramps et al., 2002; Parker et al., 2002; Thompson et al., 2002). Intriguingly, Pygo is largely dispensable in the absence of Groucho (Mieszczanek et al., 2008), which implicates this protein in alleviating Groucho-dependent repression of Wg targets. Pygo has a C-terminal plant homology domain (PHD) and an N-terminal asparagine proline phenylalanine (NPF) motif, each essential for development and tissue patterning (Mosimann et al., 2009). Much is known about the PHD finger, which binds to Legless/BCL9 (Kramps et al., 2002) and to histone H3 tail methylated at lysine 4 via opposite surfaces (Fiedler et al., 2008; Miller et al., 2013) that are connected by allosteric communication (Miller et al., 2010). By contrast, the NPF ligand is unknown, but two contrasting models have been proposed for its function (Figure 1). Two models of Pygo function. (A) The co-activator model (Kramps et al., 2002; Hoffmans et al., 2005): the NPF ligand (X, orange) is a transcriptional co-activator recruited to dTCF enhancers exclusively during Wnt signaling through the Pygo-Legless/BCL9 adaptor chain (Stadeli and Basler, 2005), co-operating with other transcriptional co-activators recruited to the C-terminus of Armadillo (such as chromatin remodelers and modifiers, black) in stimulating Wg-induced transcription. 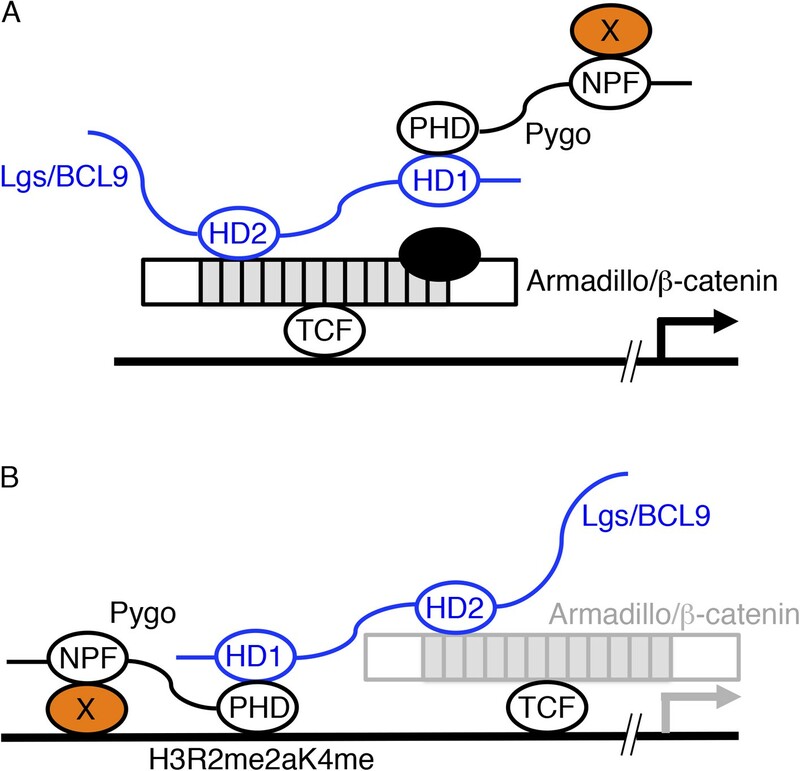 (B) The Armadillo-loading model (Townsley et al., 2004): the NPF ligand (X, orange) mediates constitutive tethering of Pygo to dTCF enhancers prior to Wg signaling, jointly with PHD-mediated recognition of H3K4me1 (marking poised enhancers; Kharchenko et al., 2011) or H3R2me2aK4me1 (marking silenced enhancers in the process of being activated; Kirmizis et al., 2007), priming these enhancers for Wg responses via its ability to capture Armadillo (once available during Wg signaling, indicated by grey) through the Legless/BCL9 adaptor. In both models, the homology domain 1 (HD1) of Lgs/BCL9 binds to the Pygo PHD finger, while HD2 binds to the N-terminus of the Armadillo Repeat Domain (light grey) of Armadillo/β-catenin (Kramps et al., 2002; Sampietro et al., 2006; Fiedler et al., 2008; Miller et al., 2013). Here, we use a proteomics approach to discover that the NPF ligand is an ancient protein complex composed of Chip/LDB ((Lin-11 Isl-1 Mec-3-) LIM-domain-binding protein) and single-stranded DNA-binding protein (SSDP), also called SSBP. This complex controls remote Wnt- and Notch-responsive enhancers of homeobox genes in flies (Bronstein and Segal, 2011), and remote enhancers of globin and other erythroid genes in mammals, integrating lineage-specific inputs from LIM-homeobox (LHX) proteins and other enhancer-binding proteins (Love et al., 2014). 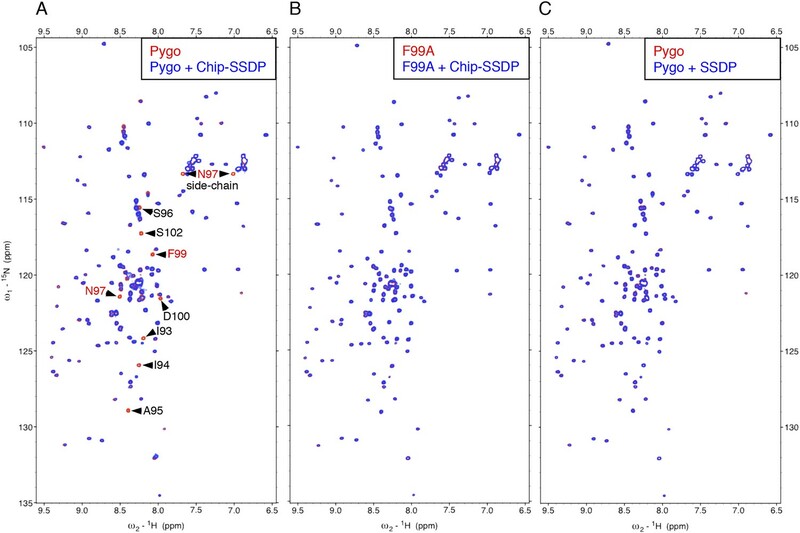 Using nuclear magnetic resonance (NMR) spectroscopy, we demonstrate that Chip/LDB-SSDP (ChiLS) binds directly and specifically to Pygo NPFs, and also to NPF motifs in Runt-related transcription factors (RUNX) proteins and Osa (Drosophila ARID1), whose relevance is shown by functional analysis of Drosophila midgut enhancers. Furthermore, we identify Groucho as another new ligand of ChiLS by mass spectroscopy. We thus define the core components of a Wnt enhanceosome assembled at TCF enhancers via Groucho/TLE and RUNX, primed for timely Wnt responses by ChiLS-associated Pygo. The pivotal role of ChiLS in integrating the Wnt enhanceosome provides a molecular explanation for the context-dependence of TCFs. To identify the NPF ligand of Drosophila Pygo, we inserted various tags into its low-complexity linker that separates NPF from PHD (Figure 2—figure supplement 1A), and used stably transfected S2 cell lines expressing wild-type (wt) or NPF-mutant versions, for tandem-affinity purification of associated proteins and identification by mass spectrometry. We thus discovered Chip, SSDP and three LIM domain proteins—Beadex and CG5708 (both LIM-only proteins, LMO) and Apterous (an LHX)—amongst the top hits specifically associated with wt but not mutant Pygo (Figure 2A). These proteins are known to form a complex: Chip dimerizes through DD (dimerization domain) and binds to SSDP through LDB/Chip conserved domain (LCCD) and to LIM domains through LIM-interacting domain (LID). The latter allow ChiLS to associate with enhancers, either directly through LHX (e.g., Apterous), or indirectly through LMO adaptors that bind to bHLH (e.g., Achaete/Scute) and GATA factors (e.g., Pannier) (Bronstein and Segal, 2011; Love et al., 2014). Indeed, LMOs displace LHXs from ChiLS by virtue of their high expression level and/or high affinity for LID (Milan and Cohen, 1999; Ramain et al., 2000; Matthews et al., 2008), and are thus capable of switching from LHX to GATA/bHLH. We also found ChiLS components associated with Pygo2 in stably transfected HEK293T cell lines, and with recombinant triple-NPF baits in lysates from mouse brains and colorectal cancer cell lines (Figure 2—figure supplement 1B–D). Pygo NPF binds to ChiLS. (A) Top proteins associated with wt but not NPF-mutant Pygo in S2 cells (unweighted spectral counts >95% probability are given); bold, ChiLS and its ligands. 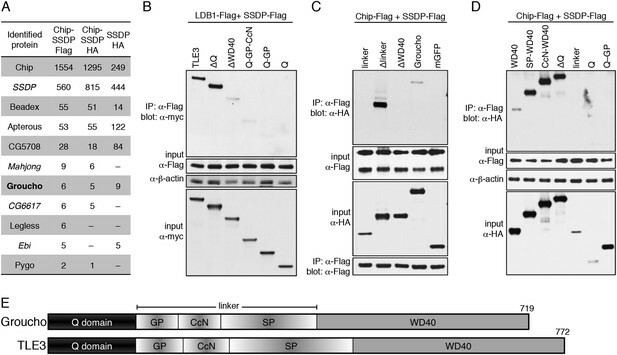 (B–D) Western blots of coIPs from transfected HEK293T cells, showing NPF-dependent coIP of (B, C) endogenous LDB1 with HA-Pygo2 or (D) wt vs truncated LDB1-Flag with HA-Pygo2 (left), and LDB1-Flag +/− SSDP-Flag with HA-Pygo2 (right; increasing amounts of LDB1-Flag indicated above panel). Co-immunoprecipitation (coIP) assays in transfected HEK293T cells revealed that only Chip but none of the other hits coIPed with Pygo. Furthermore, wt but not mutant HA-Pygo2 coIPs with endogenous LDB1, and vice versa (Figure 2B,C). The conserved proline cluster upstream of NPF is also required for binding, consistent with transcription assays in S2 cells that indicated the function of this cluster (Stadeli and Basler, 2005). Testing truncations of LDB1 for coIP with Pygo2, we found that LID is dispensable for binding, whereas dimerization seems important since there is little interaction with Pygo2 in the absence of DD (Figure 2D). Importantly, LDB1 coIPs with Pygo2 in a dose-dependent way upon co-expression, whereas SSDP hardly coIPs with Pygo2 in the absence of exogenous LDB1, even at high SSDP excess (Figure 2D). The reverse could not be established since LDB1 overexpressed on its own is highly unstable (Figure 2D), being targeted for proteasomal degradation in the absence of SSDP (Xu et al., 2007b). This reinforces the notion that Pygo NPF binds to Chip/LDB. To test direct binding of NPF to ChiLS, we purified the NPF-interacting DD-LCCD fragments of Chip and LDB1 after bacterial expression. Both have a strong tendency to aggregate if expressed on their own, but become soluble if co-expressed with SSDP1-92 (i.e., the LisH domain-containing N-terminus of the fly protein, without its unstructured tail; this LisH domain is nearly identical to its human counterpart, with two residues only semi-conserved). Expressed by itself, SSDP1-92 is soluble and elutes as a single peak after gel filtration, regardless of concentration (Figure 3A). 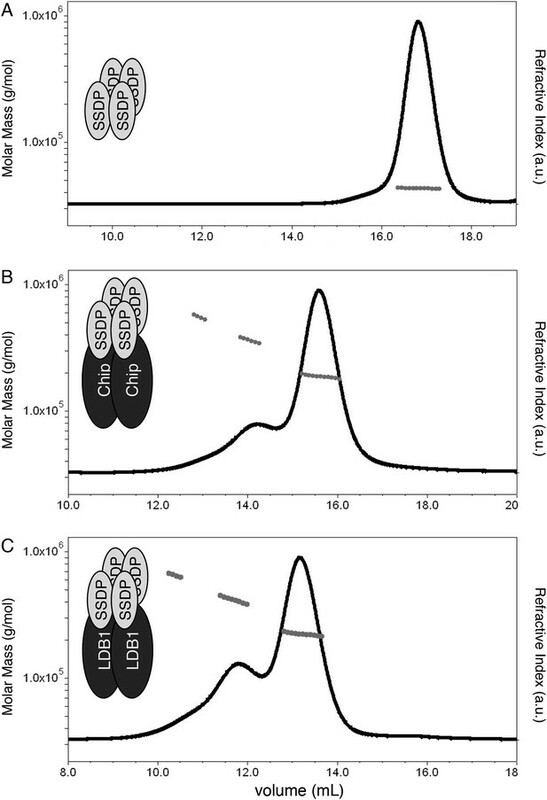 Size exclusion chromatography coupled to multi-angle light scattering (SEC-MALS) revealed an average apparent molecular mass of 43 kDa for the protein in this peak, which corresponds to a tetramer (expected molecular mass 42.7 kDa). Evidently, SSDP1-92 forms a stable tetramer in solution. We note that LisH domains typically form dimers, but some tetramerize (e.g., that of TBL1, a subunit of a HDAC-recruiting co-repressor; Oberoi et al., 2011). Stoichiometry of the ChiLS complex. SEC-MALS of (A) Lip-SSDP1-92, or co-expressed (B) Lip-SSDP1-92 + MBP-Chip205-436 or (C) Lip-SSDP1-92 + MBP-LDB156-285; solid black lines, elution profile as detected by the RI detector; grey circles, molecular mass; cartoons in panels indicate stoichiometries consistent with the measured molecular masses. On co-expression, Chip205-436 and SSDP1-92 form a stable complex that elutes consistently as one main peak with a higher-mass shoulder after gel filtration (Figure 3—figure supplement 1), regardless of concentration. The peaks of these two species are not baseline-resolved during SEC-MALS, but their average masses of ∼190 kDa and ∼380 kDa suggest that the shoulder is a dimer of the major ∼190 kDa species (Figure 3B). The latter thus corresponds to an MBP-Chip dimer bound to an SSDP tetramer (expected 181 kDa), the only possible stoichiometry that fits the observed molecular mass. The same architecture is also found for the human LDB1-SSDP complex (Figure 3C), revising previous models of ChiLS (e.g., Bronstein and Segal, 2011). To monitor direct NPF-dependent binding, we incubated purified Chip-SSDP with wt and mutant 15N-labeled Lipoyl-tagged (Lip) Pygo67-107 (15N-Nterm) and recorded heteronuclear single-quantum correlation (HSQC) spectra by NMR. We thus observed clear line broadenings with wt (Figure 4A) but not with F99A mutant 15N-Nterm (bearing a point mutation in NPF; Figure 4B). Incubation of wt 15N-Nterm with purified SSDP1-92 did not produce any spectral changes (Figure 4C), confirming that SSDP does not bind NPF (Figure 2D). We were unable to test binding to Chip205-436 alone, owing to its aggregation. LDB1-SSDP also binds to wt but not F78A mutant Pygo2 (Figure 4—figure supplement 1). Direct NPF-dependent binding of Pygo by ChiLS. Overlays of HSQC spectra of 50 μM 15N-labeled wt or F99A mutant Pygo67-107 alone (red) or probed with (A, B) MBP-Chip205-436- Lip-SSDP1-92 or (C) Lip-SSDP1-92 alone (blue); interacting residues are labeled, with NPF in red (binding to P is not detectable by HSQCs). The HSQC obtained with 50 μM of minimal 15N-labeled Pygo87-102 is indistinguishable from that shown in (A). Assignments of double-labeled protein allowed us to determine that the ChiLS ‘interaction footprints’ span 10 NPF-spanning residues in Pygo, and 25 residues in Pygo2. A minimal 16-mer without the proline cluster produces a comparable interaction (Figure 5A), showing that this cluster is dispensable in this binding assay. Its requirement in cell-based assays may reflect the need for a rigid spacer between NPF and the upstream nuclear localization signal. Notably, the residues immediately flanking the NPF are conserved (Figure 5A) and may contribute to binding (see ‘Discussion’). ChiLS binds to RUNX NPFs. (A) Summary of NMR binding assays of 15N-labeled NPF fragments probed with ChiLS; +–+++, estimates of binding affinities, based on minimal ChiLS concentrations required for line-broadening; −, no binding (see also Figure 4); top, preferred NPF context in strong binders (numbering of positions as in de Beer et al., 2000). (B) Schematic of RUNX orthologs, with DNA-binding domain (RD, black), region IIIC, activation and inhibitory domains (AD, ID), NPF (or GPF) and WRPY indicated. (C–E) Western blots as in Figure 2, showing coIP between co-expressed proteins as indicated above panels; for Runt-N and Runt-C, see (B); mGFP (control). To identify other NPF-containing proteins as putative ChiLS ligands, we conducted genome-wide database searches for matches to NPFDD-like motifs. We thus found NPFs in several enhancer-binding proteins (Figure 5A), notably in RUNX and Osa/ARID1 (the DNA-binding subunit of SWI/SNF chromatin remodeling complexes; Wu and Roberts, 2013), and also in MACC1 (metastasis-associated in colon cancer 1) whose molecular function is unknown (Stein et al., 2009). NPF-containing fragments from MACC1, RUNX2, Runt and Lozenge (fly RUNX proteins) and Osa tested positive in NMR binding assays, while those from ARID1B and RUNX3 were negative—somewhat curious in the latter case, given that its NPF motif resembles that of Runt (Figure 5A). Testing of NPF mutants confirmed NPF-specific binding (Figure 5—figure supplements 1, 2). Note that ARID1B (and its paralog ARID1A) are large proteins with multiple putative NPFs, whose binding remains to be tested. Given the linkage between RUNX and TCF in the TCRα enhancer, we decided to pursue this interaction further. In Runt, the NPF is within a short conserved sequence block abutting its Runt domain (the DNA-binding domain; Figure 5B), called region IIIC which is conserved in Runt orthologs of other invertebrates and functionally relevant in Drosophila (Walrad et al., 2010). In vertebrate RUNX2/3, the NPFs are further downstream, at the start of a conserved sequence block (Figure 5B). Interestingly, AML1 paralogs do not exhibit an NPF motif at this position, although we note a near-invariant GPFQT/A motif further downstream in all three RUNX paralogs, which could potentially also bind to ChiLS. CoIP assays revealed that full-length Runt coIPs efficiently with ChiLS (Figure 5C), more so than Pygo (Figure 5D), pointing to a second (stronger) interaction between Runt and ChiLS. Indeed, the N-terminal half of Runt (without NPF) coIPs with ChiLS (and vice versa), as does an NPF-mutant Runt, while the C-terminal half of Runt does not (Figure 5C). Evidently, the affinity of the Runt NPF for ChiLS (estimated to be high μM; Figure 5—figure supplement 1) is too low for Runt to remain associated with ChiLS during coIP. Rather, this interaction depends on the Runt domain to which ChiLS binds directly, as can be shown by NMR (Figure 5—figure supplement 3). Efficient coIP with ChiLS was also observed for AML1, Runx2 and Runx3 (Figure 5E), consistent with the previously reported association of Runx1 with Ldb1 in differentiated mouse erythroleukemic cells (Meier et al., 2006). 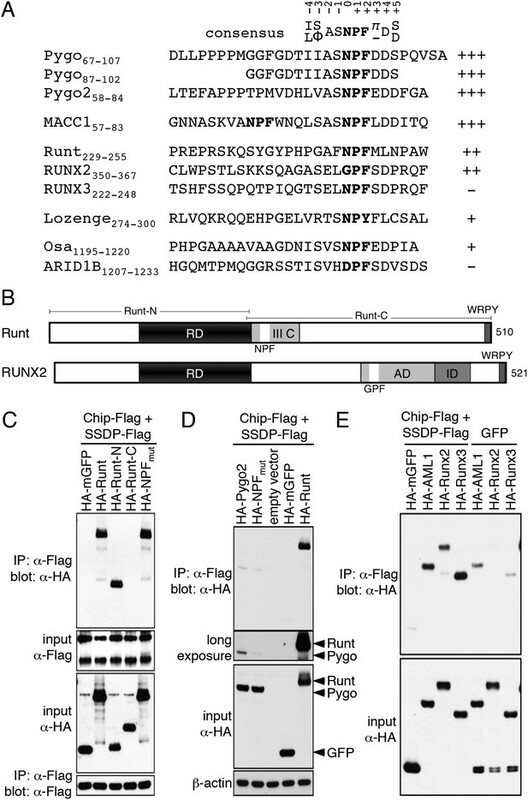 RUNX are context-dependent enhancer-binding proteins that control transcription of master-regulatory genes in Drosophila and mammals, co-operating with TCFs (e.g., in the TCRα enhancer; Figure 6A), but also with other signaling inputs including TGF-β/SMAD and Notch (Canon and Banerjee, 2000; Chuang et al., 2013). Indeed, the midgut enhancers from the homeotic (HOX) genes Ultrabithorax (Ubx) and labial each contains two putative RUNX binding sites, linked to functional signal response elements such as dTCF binding sites and CREs (Figure 6A). We exploited these enhancers, to test whether Runt directly controls Ubx and labial during endoderm induction (Figure 6B). This seemed possible, given that runt is required for normal Ubx expression in the embryonic visceral mesoderm (Tremml and Bienz, 1989). Runt acts through the labial midgut enhancer. (A) Cartoon of UbxB, lab550 and TCRα enhancers, with the following binding sites (responding to signals, as indicated in brackets): green, dTCF (Wg); purple, SMAD (Dpp); light-blue, Ets (Ras); blue, CRE (Ras); in UbxB, the SMAD binding site also mediates Wg-mediated repression by Brinker (red), and CRE mediates Osa-mediated repression (see text); black, RUNX; orange, Labial; residue numbers between binding sites are given (right, total length; note that UbxB and lab550 extend beyond these modules which however contain all known functional binding sites); capital letters, matches to binding site consensus sequences (C/G G C/G G G T C/G for RUNX; Melnikova et al., 1993). (B) Cartoon of endoderm induction, color-coded as in (A); V, midgut constrictions at parasegment boundaries. (C, D) 14 hr old embryos stained with α-Labial; arrow marks incipient second midgut constriction, lacking in runt mutants (which only form first and third constrictions, arrowheads). (E–K) 12–14 hr old embryos bearing wt or mutant lab550 as indicated on the right, stained with α-β-galactosidase; high magnification views are imaged at different focal planes, to highlight Wg-dependent expression gradients (Wg sources indicated by asterisks). Staining runt mutant embryos with α-Labial antibody, we discovered that these mutants lack the middle midgut constriction, the signature phenotype found in all mutants with defective endoderm induction (including wg and pygo; Bienz, 1994; Thompson et al., 2002). Furthermore, staining is significantly weaker than in the wt, and exhibits no gradient (Figure 6C,D), mimicking the phenotype seen in wg mutants (Bienz, 1994; Thompson et al., 2002) (although Wg is expressed in runt mutants; Figure 6—figure supplement 1). Thus, runt is required for endoderm induction, likely for the Wg response of labial. Next, we mutated the two Runt binding sites in the labial enhancer (lab550R), to test their function in transgenic lines with single copies of chromosomally integrated LacZ reporters. lab550 produces a gradient of LacZ staining (Figure 6E) recapitulating endogenous Labial expression (Tremml and Bienz, 1992) (Figure 6C). This LacZ staining is much reduced in runt mutants, with no discernible gradient (Figure 6F), as in wg mutants. Similarly, lab550R mediates relatively weak and even LacZ expression, limited to a narrow band of cells (Figure 6G), which phenocopies the LacZ pattern from an enhancer with mutant dTCF binding sites (lab550L; Figure 6H). Importantly, lab550 is strongly activated posteriorly if Runt is expressed throughout the endoderm (Figure 6I), while neither lab500R nor lab550L are Runt-responsive (Figure 6J,K). Thus, Runt acts through lab550, apparently cooperating with dTCF to render lab550 signal-responsive. Likewise, the Runt binding sites in the Ubx midgut enhancer are also functional targets of Runt (Figure 6—figure supplement 1), implicating Runt in the Wg-dependent indirect autoregulation of Ubx at the top of the inductive cascade (Figure 6B). Recall that neither Pygo nor ChiLS bind to DNA, nor to TCFs, raising the question how these proteins are recruited to TCF enhancers. To answer this, we used the same approach as described (Figure 2), to identify new ChiLS-interacting factors by mass spectrometry. Using SSDP as bait, we found Chip as the top hit (Figure 7A), confirming efficient complex formation between the two proteins (van Meyel et al., 2003; Xu et al., 2007b), comparable to that in the other two samples with co-overexpressed Chip and SSDP. (A) Top proteins associated with >2 baits (as indicated in table) in S2 cells, in addition to Legless and Pygo (unweighted spectral counts as in Figure 2A). (B–D) Western blots as in Figure 5C, showing coIP between co-expressed wt and truncated proteins as indicated above panels. (E) Cartoon of Groucho and TLE3, with domains indicated (GP, CcN, SP, semi-conserved elements within linker). Looking for hits with similar spectral counts in all three coIPs provided a stringent criterion that eliminated most hits (many of which were false positives as they scored highly in the Flag but not HA IPs). The resulting overlap list contains Beadex, Apterous and CG5708 as the top hits, followed by Groucho (Figure 7A), the only new hit identified with high confidence. Additionally, two LisH domain-containing proteins (Ebi and CG6617) were identified with lower confidence, as well as Pygo and Legless (Figure 7A) whose low spectral counts may simply reflect low abundance (and S2 cells express neither Runt nor Lozenge). CoIPs confirmed the interaction between ChiLS and Groucho or TLE3, and revealed that the WD40 domain is both necessary and sufficient for association, while the Q domain and linker are dispensable (Figure 7B–E). Even though the minimal WD40 domain coIPs only weakly with ChiLS, the same is true for full-length Groucho, while Δlinker interacts very strongly (Figure 7C), suggesting that the linker attenuates the interaction between Groucho/Tranducin-like enhancer protein (TLE) and ChiLS, consistent with the known regulatory role of this region (controlled by phosphorylation; Turki-Judeh and Courey, 2012). Groucho's binding to Chip neither requires its LID, nor SSDP (M. F., unpublished). The WD40 propeller domain binds two classes of motifs in enhancer-binding proteins (WRPW/Y or en1, FxIxxIL) that ‘plug’ its pore (Jennings et al., 2006), but there are no convincing matches to either of these in ChiLS. Its interaction with WD40 may thus be mediated by a degenerate eh1-like or unknown motif, as found in other bona fide Groucho-binding proteins (Flores-Saaib et al., 2001; Turki-Judeh and Courey, 2012), or ChiLS may even bind to an alternative WD40 surface (for a precedent, see He et al., 2013). Crucially, since Groucho/TLE binds to TCF via its Q domain (Mieszczanek et al., 2008; Chodaparambil et al., 2014), it can thus function as an adaptor between ChiLS and TCF. We note that the WD40 domain also binds to the WRPY motif at the C-terminus of RUNX proteins (Canon and Banerjee, 2000; Chuang et al., 2013). chip is required for the function of remote enhancers of the homeobox genes cut (a Notch and Wg target which patterns the wing margin), and of Ubx (Morcillo et al., 1996) which specifies the middle body region including the third leg and haltere (the dorsal appendage that substitutes for the hind wing in flies). Furthermore, chip is required for Apterous-dependent wing development (Milan and Cohen, 1999), and for the notum bristles which are specified by Pannier and Achaete/Scute in a Wg-dependent fashion (Garcia–Garcia et al., 1999; Ramain et al., 2000). ssdp mutant clones produce wing defects that phenocopy pygo mutant clones (van Meyel et al., 1999). Transcriptional profiling of ssdp mutant wing discs identified numerous negatively-regulated SSDP target genes linked to Apterous and Pannier binding sites (Bronstein et al., 2010). Strikingly, the top scoring positively-regulated SSDP target genes were linked to dTCF binding sites (although this is not mentioned in the text, but see Table S3 in Bronstein et al., 2010)—a strong indication that SSDP promotes primarily dTCF-dependent transcription in this tissue. Clonal analysis in wing discs confirmed that chip and ssdp control dTCF targets including vestigial and wg, similarly to pygo (Figure 8—figure supplement 1). In haltere discs, ssdp and pygo are required for high levels of Ubx expression, causing similar overgrowth phenotypes in halteres (Figure 8—figure supplement 2). These similarities between the ssdp and pygo mutant defects in the primordia for the dorsal appendages implicate both genes in the control of Wg-dependent master-regulatory genes. chip has a pioneer-like role in the early embryo, when zygotic transcription starts at the maternal-zygotic transition, enabling expression of segmentation genes along the antero-posterior axis (Morcillo et al., 1997). We confirmed that embryos without maternal and zygotic Chip (chip germ-line clones, glcs) do not develop, except for rare escapers which show severe expression defects of segmentation genes, including even-skipped (eve) (Morcillo et al., 1997) (J. M., unpublished). 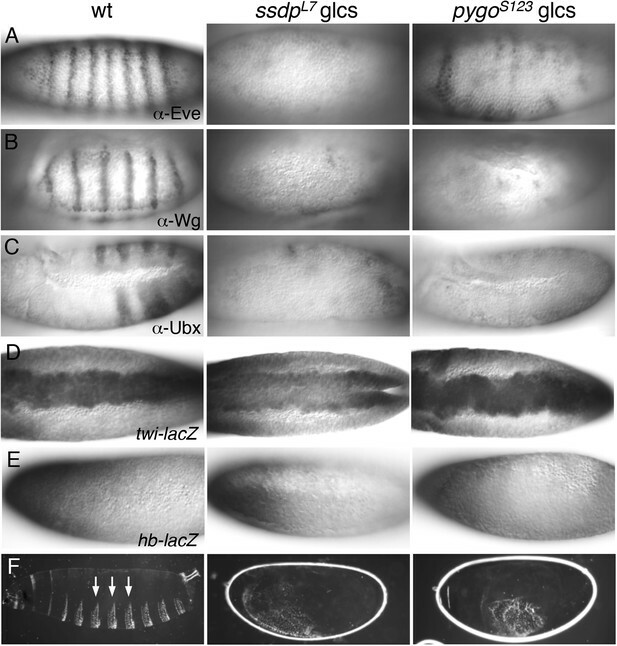 Eve is a master-regulatory homeobox gene expressed in stripes along the embryonic antero-posterior axis where it activates numerous genes including wg (Kobayashi et al., 2001) and Ubx (Tremml and Bienz, 1989; Muller and Bienz, 1992). Nothing is known about ssdp function in embryos. Antibody staining of ssdp glcs revealed only residual expression of Eve, Wg and Ubx (Figure 8A–C). In contrast, twi-LacZ (recapitulating endogenous twist, a mesoderm-specifying bHLH gene activated in the ventral-most zone; Thisse et al., 1991) appears normal in ssdp glcs (Figure 8D). Likewise, hb-LacZ (recapitulating expression of endogenous hunchback, a gene specifying anterior development; Struhl et al., 1992) is normal in these mutants (Figure 8E). These ssdp defects phenocopy those of chip glcs (Morcillo et al., 1997), and they indicate that ChiLS is required for gene activity along the antero-posterior but not the dorso-ventral axis. An important corollary is that Wg is never expressed in embryos lacking ChiLS. In support of this, the cuticles of the rare chip glc escapers show a lawn of ventral denticles (Morcillo et al., 1997), as do ssdp glcs (Figure 8F) and pygo glcs (Parker et al., 2002; Thompson et al., 2002)—the hallmark of Wg signaling failure (Cadigan and Nusse, 1997). ssdp and pygo mutants show similar early embryonic defects. (A–E) 3–5 hr old wt and mutant glc embryos as indicated above panels, stained with antibodies as indicated in panels. (F) Larval cuticles of wt and mutant glc embryos; denticle belts (arrows) signify lack of Wg signaling. We also examined glcs bearing a pygo null allele (Thompson et al., 2002), which revealed considerable defects in Eve and Ubx expression, and almost complete absence of Wg (Figure 8A–C), as previously reported for a different null pygo allele (Parker et al., 2002). These Wg-independent defects are not detectable with weaker pygo truncation alleles that merely lack the PHD finger (Kramps et al., 2002; Thompson et al., 2002), confirming that the (ChiLS-dependent) activation of segmentation genes along the antero-posterior axis resides in the NPF-containing N-terminus of Pygo. Our discovery of ChiLS as the NPF ligand of Pygo proteins led us to define the core components of a multi-protein complex tethered to TCF enhancers via Groucho/TLE and RUNX, and slated for subsequent Wnt responses by Pygo (Figure 9). ChiLS also contacts additional enhancer-binding proteins via its LID, including lineage-specific and other signal-responsive factors (Bronstein and Segal, 2011), thereby integrating multiple position-specific inputs into TCF enhancers, which provides a molecular explanation for the context-dependence of TCF/LEF. We shall refer to this complex as the Wnt enhanceosome since it shares fundamental features with the paradigmatic interferon β-responsive enhanceosome (Panne et al., 2007). Its components are conserved in placozoa, arguably the most primitive animals without axis and tissues with only a handful of signaling pathways including Wnt, Notch and TGF-β/SMAD (Ringrose et al., 2013), suggesting that the Wnt enhanceosome emerged as the ur-module integrating signal-responses. Model of the Wnt enhanceosome. Switching of the Wnt enhanceosome from OFF (top) to ON (middle), and towards re-repression (bottom), prefacing re-recruitment of Groucho/TLE; S, SSDP; Q, Q domain; W, WD40 domain; NPF-mediated interactions are indicated by arrowheads; green, positively-acting components; red, negatively-acting components; known oncogenes and tumor suppressors are circled in bold. The stoichiometry of ChiLS allows simultaneous interaction with NPF and LID-binding factors, although these may also displace each other, as indicated (except for RUNX, arbitrarily shown as ChiLS-associated throughout). Indicated conformational changes are entirely hypothetical. Other proteins have been reported to interact with the Pygo N-terminus (Carrera et al., 2008; Wright and Tjian, 2009; Chen et al., 2010), but none of these recognize NPF. We note that this N-terminus is composed of low-complexity (intrinsically disordered) sequences that are prone to non-specific binding. NPF is a versatile endocytosis motif that binds to structurally distinct domains (Mahadev et al., 2007), including eps15 homology (EH) domains in epsin15 homology domain (EHD) proteins (Kieken et al., 2010). Indeed, we consistently identified EHDs in lysate-based pull-downs with triple-NPF baits (Figure 2—figure supplement 1D). EHDs are predominantly cytoplasmic, and do not interact with nuclear Pygo upon co-expression (M. G., unpublished), nor are any of the Drosophila EHDs required for Wg signaling in S2 cells (Stadeli and Basler, 2005). ChiLS is the first nuclear NPF-binding factor. NPF binding to ChiLS appears to depend on the same residues as NPF binding to EHD domains (de Beer et al., 2000), that is, on the aromatic residue at +2 (Figure 4), the invariant P at +1, N (or G) at 0 and NPF-adjacent residues (Figure 5A), including negative charges at +3 and +4 (whereby a positive charge at +3 abolishes binding to EHD; Kieken et al., 2010). Indeed, an intramolecular interaction between the +3 side-chain and that of N predisposes NPF to adopt a type 1 β-turn conformation, which increases its affinity to the EHD pocket, while the −1 residue undergoes an intermolecular interaction with this pocket (de Beer et al., 2000). ChiLS also shows a preference for small residues at −1 and −2, similarly to N-terminal EHDs (Paoluzi et al., 1998) although RUNX seems to differ at −1 and −2 from Pygo and MACC1 (F/L A/E/D vs S A, respectively). RUNX as the keystone of the Wnt enhanceosome? Groucho/TLE is recruited to TCF via its Q domain, which tetramerizes (Chen et al., 1998; Chodaparambil et al., 2014). Intriguingly, the short segment that links two Q domain dimers into a tetramer (Chodaparambil et al., 2014) is deleted in a dTCF-specific groucho allele that abolishes dTCF binding and Wg responses (Mieszczanek et al., 2008), suggesting that TCF may normally bind to a Groucho/TLE tetramer. Groucho/TLE uses its second domain, the WD40 propeller, to bind to other enhancer-binding proteins on Wnt-responsive enhancers (Turki-Judeh and Courey, 2012), most notably to the C-terminal WRPY motif of RUNX proteins (common partners of TCFs in Wnt-responsive enhancers; Figure 6A). This interaction can occur simultaneously with the WD40-dependent binding to ChiLS (Figure 7F), given the tetramer structure of Groucho/TLE. In turn, RUNX uses its DNA-binding Runt domain to interact with HMG domains of TCFs (Kahler and Westendorf, 2003; Ito et al., 2008), and to recruit ChiLS (Figure 5—figure supplement 3). RUNX thus appears to be the keystone of the Wnt enhanceosome since it binds to the enhancer directly while undergoing simultaneous interactions with Groucho/TLE (through its C-terminal WRPY motif), TCF and ChiLS (though its Runt domain). In line with this, Runt has pioneering functions in the early Drosophila embryo, shortly after the onset of zygotic transcription (Canon and Banerjee, 2000), and in the naïve endoderm (Figure 6) as soon as this germlayer is formed, in each case prior to the first Wg signaling events. RUNX paralogs also have pioneer-like functions in specifying cell lineages, that is, definitive hematopoiesis in flies and mammals (Chuang et al., 2013). Our model predicts that ChiLS, once tethered to the enhanceosome core complex, recruits Pygo via NPF to prime the enhancer for Wnt responses (Figure 9). Given the dimer-tetramer architecture of ChiLS (Figure 3C), its binding to Pygo can occur simultaneously to its NPF-dependent binding to RUNX. In turn, tethering Pygo to the Wnt enhanceosome may require Pygo's binding to methylated histone H3 tail (Fiedler et al., 2008; Miller et al., 2013), similarly to Groucho/TLE whose tethering to enhancers depends on binding to hypoacetylated histone H3 and H4 tails (Sekiya and Zaret, 2007). Interestingly, Pygo's histone binding requires at least one methyl group at K4 (Fiedler et al., 2008; Miller et al., 2013)—the hallmark of poised enhancers (Kharchenko et al., 2011). Indeed, Drosophila Pygo is highly unorthodox due to an architectural change in its histone-binding surface that allows it to recognize asymmetrically di-methylated arginine 2 (Miller et al., 2013)—a hallmark of silent chromatin (Kirmizis et al., 2007). Thus, the rare unorthodox Pygo proteins (Miller et al., 2013) may recognize silent enhancers even earlier, long before their activation, consistent with the early embryonic function of Pygo, prior to Wg signaling (Figure 8). Overcoming the OFF state imposed on the enhancer by Groucho/TLE (Mieszczanek et al., 2008) involves Pygo-dependent capturing of β-catenin/Armadillo, which recruits various transcriptional co-activators to its C-terminus (Mosimann et al., 2009). Although these include CREB-binding protein (CBP), a histone acetyl transferase, its tethering to TCF enhancers is likely to co-depend on CRE-binding factors (CREB, c-Fos) and SMAD (Bienz, 1997; Waltzer and Bienz, 1999) which synergize with Armadillo to activate these enhancers (Bienz, 1997; Waltzer and Bienz, 1999)—similarly to the interferon-β enhanceosome where CBP recruitment also co-depends on multiple enhancer-binding proteins (Panne et al., 2007). 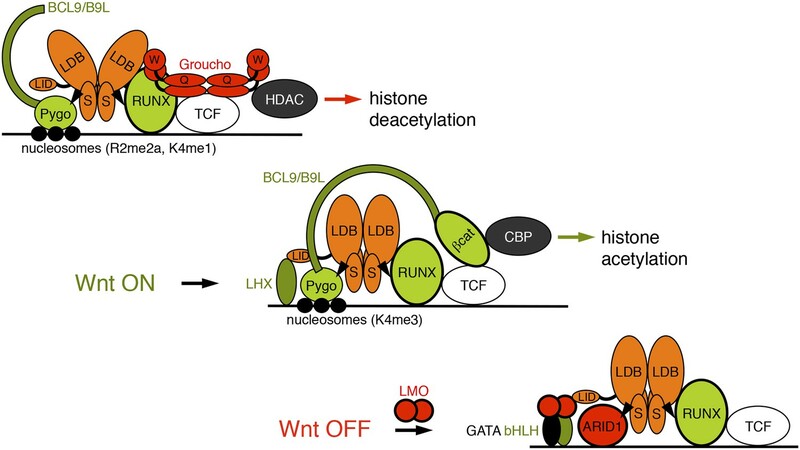 The ensuing acetylation of the Wnt enhancer chromatin could promote the eviction of Groucho/TLE whose chromatin anchoring is blocked by acetylation of histone H3 and H4 tails (Chodaparambil et al., 2014), thus initiating the ON state. Osa antagonizes Wg responses throughout development, and represses UbxB through its CRE (Collins and Treisman, 2000), which also mediates repression in response to high Wg signaling (Yu et al., 1998) (Figure 6B). Osa could therefore terminate enhancer activity, by displacing HAT-recruiting enhancer-binding proteins such as CREB and c-Fos from CREs and by cooperating with repressive enhancer-binding proteins such as Brinker (a Groucho-recruiting repressor that displaces SMAD from UbxB; Saller and Bienz, 2001; Saller et al., 2002) to re-recruit Groucho/TLE to the enhancer, thereby re-establishing its OFF state (Figure 9). Notably, Osa binds Chip, to repress various Wg and ChiLS targets including achaete-scute and dLMO (Heitzler et al., 2003; Milan et al., 2004). Therefore, ChiLS is not only a coincidence detector of multiple enhancer-binding proteins and NPF proteins, but also a switch module that exchanges positively- and negatively-acting enhancer-binding proteins (through LID) and NPF factors, to confer signal-induced activation, or re-repression (Figure 9). Its stoichiometry and modularity renders it ideally suited to both tasks. We note that the interferon-β enhanceosome does not contain a similar integrating module (Panne et al., 2007), perhaps because it is dedicated to a single signaling input. ChiLS is essential for activation of master-regulatory genes in the early embryo (Morcillo et al., 1997) (Figure 8), similarly to DNA-binding pioneer factors such as Zelda (in the Drosophila embryo) or FoxA (in the mammalian endoderm) which render enhancers accessible to enhancer-binding proteins (Zaret and Carroll, 2011). Moreover, ChiLS maintains HOX gene expression throughout development (Figure 5; Figure 8—figure supplement 2), enabling Wg to sustain HOX autoregulation, a mechanism commonly observed to ensure coordinate expression of HOX genes in groups of cells (Bienz, 1994). Another hallmark of pioneer factors is that they initiate communication with the basal transcription machinery associated with the promoter. Chip is thought to facilitate enhancer-promoter communication (Morcillo et al., 1997), possibly by bridging enhancers and promoters through self-association (Cross et al., 2010) (Figure 3). Indeed, Ldb1 occupies both remote enhancers and transcription start sites (e.g., of globin genes and c-Myb; Love et al., 2014), likely looping enhancers to the basal transcription machinery at promoters (Deng et al., 2012; Stadhouders et al., 2012) which requires self-association (Krivega et al., 2014), but possibly also other factors (such as cohesin, or mediator; Levine et al., 2014). We note that the chromatin association of Ldb1 has typically been studied in erythroid progenitors or differentiated erythroid cells (Love et al., 2014), following activation of erythoid-specific genes (Stadhouders et al., 2012). It would be interesting (if technically challenging) to examine primitive cells, to determine whether ChiLS is associated exclusively with poised enhancers prior to cell specification or signal responses. Previous genetic analysis in Drosophila has linked chip predominantly to Notch-regulated processes (Bronstein and Segal, 2011). Likewise, groucho was initially thought to be dedicated to repression downstream of Notch (Preiss et al., 1988), before its role in antagonizing TCF and Wnt responses emerged (Roose and Clevers, 1999). Moreover, Lozenge facilitates Notch responses in the developing eye, and in hematocytes (Canon and Banerjee, 2000; Terriente-Felix et al., 2013). Indeed, the first links between Groucho/TLE, RUNX and nuclear Wnt components came from physical interactions (Roose and Clevers, 1999), as in the case of ChiLS (Figure 2). Our work indicates that these nuclear Notch signaling components constitute the Wnt enhanceosome. Although our most compelling evidence for this notion is based on physical interactions, the genetic evidence from Drosophila is consistent with a role of ChiLS in Wg responses (Bronstein et al., 2010) (Figure 6; Figure 8—figure supplements 1, 2). Indeed, mouse Ldb1 has been implicated in Wnt-related processes, based on phenotypic analysis of Ldb1 knock-out embryos and tissues (Mukhopadhyay et al., 2003; Mylona et al., 2013). Notably, Ldb1 has wide-spread roles in various murine stem cell compartments that are controlled by Wnt signaling (Xu et al., 2007a; Dey-Guha et al., 2009; Li et al., 2011; Salmans et al., 2014). An interesting corollary is that the Wnt enhanceosome may be switchable to Notch-responsive, by NPF factor exchange and/or LMO-mediated enhancer-binding protein exchange at ChiLS (Figure 9). Hairy/Enhancer-of-split (HES) repressors could be pivotal for this switch (Delidakis et al., 2014): these bHLH factors are universally induced by Notch signaling, and they bind to ChiLS enhancers to re-recruit Groucho/TLE via their WRPW motifs (Turki-Judeh and Courey, 2012). HES repressors may thus be capable of re-establishing the OFF state on Wnt enhancers in response to Notch. Notably, restoring a high histone-binding affinity in Drosophila Pygo by reversing the architectural change in its histone-binding surface towards human renders it hyperactive towards both Wg and Notch targets (Miller et al., 2013) even though pygo is not normally required for Notch responses in flies. Humanized Pygo may thus resist the Notch-mediated shut-down of the Wnt enhanceosome, owing to its elevated histone affinity that boosts its enhancer tethering, which could delay its eviction from the enhanceosome by repressive NPF factors. The apparent Notch-responsiveness of the Wnt enhanceosome supports our notion that orthodox Pygo proteins (as found in most animals and humans) confer both Wnt and Notch responses (Miller et al., 2013). Previous genetic studies have shown that the components of the Wnt enhanceosome (e.g., TCF, RUNX, ChiLS and LHX) have pivotal roles in stem cell compartments, as already mentioned (see also Folgueras et al., 2013; Lien and Fuchs, 2014), suggesting a universal function of this enhanceosome in stem cells. It is therefore hardly surprising that its dysregulation, that is, by hyperactive β-catenin, is a root cause of cancer, most notably colorectal cancer but also other epithelial cancers (Clevers, 2006). Indeed, genetic evidence implicates almost every one of its components (as inferred from the fly counterparts) in cancer: AML1 and RUNX3 are tumour suppressors whose inactivation is prevalent in myeloid and lymphocytic leukemias (Mangan and Speck, 2011), and in a wide range of solid tumors including colorectal cancer (Chuang et al., 2013), respectively. Likewise, ARID1A is a wide-spread tumor suppressor frequently inactivated in various epithelial cancers (Wu and Roberts, 2013). Furthermore, many T-cell acute leukemias can be attributed to inappropriate expression of LMO2 (Rabbitts, 1998). Intriguingly, AML1 and ARID1A behave as haplo-insufficient tumor suppressors, consistent with the notion that these factors compete with activating NPF factors such as Pygo2, RUNX2 and possibly MACC1 (predictive of metastatic colorectal cancer; Stein et al., 2009) for binding to ChiLS, which will be interesting to test in future. The case is compelling that the functional integrity of the Wnt enhanceosome is crucial for the avoidance of cancer. 6xHis-MBP-Chip205-436, 6xHis-MBP-LDB156-285 and 6xHis-Lip-SSDP1-92 were co-expressed with a bi-cistronic expression vector (including N-terminal Tobacco Etch virus (TEV) protease sites for removal of tags) in E. coli BL21-CodonPlus(DE3)-RIL cells (Stratagene, La Jolla, California, United States) and purified by Ni-NTA resin and size exclusion chromatography, as described (Fiedler et al., 2008). 6xHis-Lip-tagged NPF-containing fragments (Figures 4, and 5) were purified similarly, after labeling in minimal media for NMR (Miller et al., 2010, 2013). Drosophila S2 cells were grown in Lonza serum-free medium and transfected with bait plasmids (Figure 2—figure supplement 1A) using Fugene HD and subsequently grown under continuous selection with 5 μg ml−1 puromycin. For tandem-affinity purification of Pygo-associated proteins, ∼2 × 109 S2 cells (grown as suspension culture) or twenty 175 cm2 flasks of subconfluent HEK293T cells stably transfected with Pygo baits were used for each experiment. Cells were lysed in 30 ml lysis buffer (12.5 mM Tris–HCl pH 7.4, 6.25% glycerol, 125 mM NaCl, 0.625 mM EDTA, 3.1 mM NaF, 1.25 mM Na3PO4, 0.125% Triton-X-100), and sonicated 4 × 10 s at 50% intensity with a Branson 250 Sonifier. Cell lysates were cleared by centrifugation for 20 min at 15,000 rpm, and incubated (while rotating) for 1 hr with α-Flag affinity resin (Sigma) in the cold room. Immunoprecipitates were washed 4x with 1 ml lysis buffer, and subsequently eluted with 4 consecutive 500 μl elutions of lysis buffer supplemented with 200 µg ml−1 3xFlag-Peptide (Sigma). Eluates were subjected to α-Strep pull-down with 20 µl packed volume of StrepTactin (IBA Lifesciences). Beads were then washed 3x with 2 ml lysis buffer, and subsequently boiled in 50 µl 2× LDS sample buffer. Proteins were resolved on 4–12% Bis-Tris SDS-polyacrylamide gels. These were stained with Imperial Protein Stain (Thermoscientific), and gel lanes were cut into 1–2 mm slices for in situ digestion with trypsin. The analytical column outlet was directly interfaced via a modified nano-flow electrospray ionisation source, with a hybrid linear quadrupole ion trap mass spectrometer (Orbitrap LTQ XL, ThermoScientific, San Jose, United States). LC-MS/MS data were searched against a protein database (UniProt KB) with the Mascot search engine program (Matrix Science, UK) (Perkins et al., 1999). MS/MS data were validated using the Scaffold programme (Proteome Software Inc., United States). 100 μl SSDP, 6xHis-MBP-Chip–6xHis-Lip-SSDP or 6xHis-MBP-LDB1–6xHis-Lip-SSDP samples were resolved on a Superdex S-200 or Superose 6 HR 10/300 analytical gel filtration column (GE Healthcare) at 0.5 ml min−1 in 25 mM phosphate buffer, 150 mM NaCl, pH 6.7 before light scattering and concentration determination using refractive index (RI) or UV absorbance in a standard SEC-MALS configuration (containing a Wyatt Heleos II 18 angle light scattering instrument coupled to a Wyatt Optilab rEX online RI detector). Protein concentration was determined from the excess differential refractive index based on 0.186 RI increment for 1 g ml−1 protein solution. Concentrations and observed scattered intensities at each point in the chromatograms were used to calculate absolute molecular mass from the intercept of the Debye plot, using Zimm's model as implemented in Wyatt's ASTRA software. The stoichiometries of ChiLS indicated by the model-free RI measurements (using dn/dc 0.186 for 1g ml−1 protein) were further confirmed by using appropriate UV extinction coefficients and UV absorbance as the concentration measurement, which produced essentially identical masses to those from RI. They were independent of protein concentration (in the range of 0.1–10 mg ml−1). [1H,15N]fast-HSQC spectra of 15N-labeled proteins in 25 mM phosphate buffer, 150 mM NaCl were recorded with 600 MHz 1H frequency (at 25°C), and 13C/15N double-labeled samples were used for backbone resonance assignments. Datasets were acquired, processed and analyzed as described (Miller et al., 2013). The following plasmids were recloned in pCMVtag2b, for transfecting HEK293T cells (with PEI at a ratio of 1:3.5, DNA:PEI): Chip (Morcillo et al., 1997), SSDP (van Meyel et al., 1999), Groucho (Jennings et al., 2006), LDB1 (from Luc Sabourin), AML1, Runx2-P1, Runx3-P1 (from Anna Kilbey and Karen Blyth), monomeric GFP (mGFP, from John James). HA-Pygo, HA-hPygo2 (Thompson et al., 2002) and 6xMyc-TLE3 (Hanson et al., 2012) were also used. Internal deletions were generated by standard procedures in the same vectors, and verified by sequencing. Cell culture, lysate preparation and coIPs were done essentially as described (Thompson et al., 2002). The following antibodies and antibody-coupled resins were used: α-LDB1 (Epitomics); α-β-actin (Abcam); α-Flag M2, α-HA (Sigma). All Drosophila strains used are described in Flybase. The following new transgenic lines bearing mutant enhancers were generated: UbxBR was derived from mutating UbxB (in a ry+ vector; Thuringer et al., 1993), and 2 independent transformant lines were isolated by standard procedures. Likewise, lab550R and lab550L were derived from mutating lab550 (in a ry+ vector; Tremml and Bienz, 1992), and 5 independent transformat lines were isolated. The following mutations were made (numbers refer to binding site number, from 5′ to 3′): UbxB Runt1, AACCTCG > CTCTAGA; UbxB Runt2, TCTGGTA > CTCTAGA; lab550 Runt1, TTTGGTT > AAGATCT; lab550 Runt2, TGTGGTC > AAGATCT; lab550 dTCF1, TTACAAA > GCCGGCA; lab550 dTCF2, CATCAAT > GGGCCCT; lab550 dTCF3, CATCAAC > CTCGAGC; lab550 dTCF4, GTTGATG > GaGTACTG (‘a’ denotes a one-base insertion in this mutant dTCF binding site); only dTCF1 and dTCF2 binding sites are shown in Figure 6A (depicting the 5′ portion of the lab550 enhancer) while dTCF3 and dTCF4 are near the 3′ end of lab550. ssdp and pygo mutant wing disc clones were generated with vg.GAL4 UAS.flp as described (Vegh and Basler, 2003; de la Roche and Bienz, 2007; Fiedler et al., 2008), but hs.flp was used for chip mutant clones (which were generated by heat-shocking late second or early third instar larvae for 30 min at 37°C). The GAL4 drivers used for overexpressing Runt (Tracey et al., 2000) are described in Flybase (24B.GAL4, for mesodermal expression; 48Y.GAL4, for endodermal expression). Paraformaldehyde-fixed embryos were stained with α-Labial (Tremml and Bienz, 1992), α-Eve (Azpiazu et al., 1996), α-Ubx, α-Wg (Developmental Studies Hybridoma Bank), α-β-galactosidase (Promega) as described (Thompson et al., 2002). DIC optics were used for imaging embryos on a Zeiss Axiophot. Paraformaldehyde-fixed imaginal discs were stained with α-Vg (Kim et al., 1996), α-Ubx, α-Wg (Developmental Studies Hybridoma Bank), rabbit or mouse α-GFP (Sigma) as described (Thompson et al., 2002; Fiedler et al., 2008). All discs were counterstained with DAPI, to control for the focal plane, and single confocal images were acquired at identical settings with a Zeiss Confocal Microscope. Curr Opin Genet Develop 7:683–688. Seminars in Cell & Developmental Biology 11:327–336. Proceedings of the National Academy of Sciences of USA 105:6644–6649. Molecular and Cellular Biology 18:7259–7268. Molecular and Cellular Biology 30:5621–5635. International Journal of Cancer. Journal International Du Cancer 132:1260–1271. Journal of Molecular Biology 399:133–144. Current Topics in Developmental Biology 110:217–262. International Journal of Biological Sciences 5:686–694. The Journal of Biological Chemistry 278:11937–11944. The Journal of Biological Chemistry 285:8687–8694. Critical Reviews in Oncogenesis 16:77–91. Proceedings of the National Academy of Sciences of USA 105:19324–19329. Journal of Molecular Biology 401:969–984. Nature Reviews. Molecular Cell Biology 10:276–286. Nature Structural & Molecular Biology 18:177–184. Biochimica et Biophysica Acta 1424:M23–M37. Proceedings of the National Academy of Sciences of USA 100:5846–5851. Current Topics in Developmental Biology 98:65–96. Molecular Biology of the Cell 21:2315–2326. Proceedings of the National Academy of Sciences of USA 106:55–60. ARID1A mutations in cancer: another epigenetic tumor suppressor? We thank Marc Skehel and his team for the mass spectrometry, Dale Dorsett, Donald van Meyel, Steve Cohen, Sean Carroll, David Ish-Horowicz, Peter Gergen, Luc Sabourin, Anna Kilbey, Karen Blyth, Ethan Lee and John James for plasmids and antibodies, Marc de la Roche, Tom Miller, Miha Renko, Olga Perisic and Stefan Freund for help and technical advice, and Sarah Bray for discussion. This work was supported by the Medical Research Council (U105192713) and by Cancer Research UK (C7379/A8709 and C7379/A15291). © 2015, Fiedler et al. Laurens M van Tienen et al. Wnt/β-catenin signaling elicits context-dependent transcription switches that determine normal development and oncogenesis. These are mediated by the Wnt enhanceosome, a multiprotein complex binding to the Pygo chromatin reader and acting through TCF/LEF-responsive enhancers. Pygo renders this complex Wnt-responsive, by capturing β-catenin via the Legless/BCL9 adaptor. We used CRISPR/Cas9 genome engineering of Drosophila legless (lgs) and human BCL9 and B9L to show that the C-terminus downstream of their adaptor elements is crucial for Wnt responses. BioID proximity labeling revealed that BCL9 and B9L, like PYGO2, are constitutive components of the Wnt enhanceosome. Wnt-dependent docking of β-catenin to the enhanceosome apparently causes a rearrangement that apposes the BCL9/B9L C-terminus to TCF. This C-terminus binds to the Groucho/TLE co-repressor, and also to the Chip/LDB1-SSDP enhanceosome core complex via an evolutionary conserved element. An unexpected link between BCL9/B9L, PYGO2 and nuclear co-receptor complexes suggests that these β-catenin co-factors may coordinate Wnt and nuclear hormone responses.